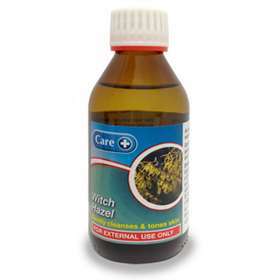 Care Witch Hazel 200ml is a gentle solution that soothes and tones whilst cleaning and removing excess oils, impurities and make up. Distilled natural Witch Hazel is ideally suited for application over the face and neck leaving the skin feeling cleansed and refreshed. Apply the solution onto cotton wool/pads and smooth over the face and neck. Do not apply to damaged, inflamed, infected or compromised skin. If you get witch hazel into your eye wash thoroughly with copious amounts of water. Do not store above 25 degrees.